Highland Park, a neighborhood of West Seattle's Delridge community, is located along Hwy 509 near the intersection with Hwy 99. It is known for its quick commutes to the industrial district, SeaTac International Airport, and Boeing. The average home for sale in Highland Park is a single family residence with about 1,300 sq. ft. of space. The neighborhood is quite affordable compared to most near Seattle. Westcrest Park, an off-leash dog park, lies within Highland Park and is a popular recreational spot. 3 Beds | 1.75 Baths | 1810 sq. Ft.
4 Beds | 3 Baths | 2005 sq. Ft.
3 Beds | 2.5 Baths | 1835 sq. Ft.
3 Beds | 2.5 Baths | 1844 sq. Ft.
4 Beds | 1.75 Baths | 1720 sq. Ft.
3 Beds | 3 Baths | 1852 sq. Ft.
4 Beds | 1.75 Baths | 1760 sq. Ft.
4 Beds | 1 Baths | 1490 sq. Ft.
3 Beds | 2 Baths | 1690 sq. Ft.
Blue Summit Realty has the most accurate and up to date Highland Park real estate listings on the web. 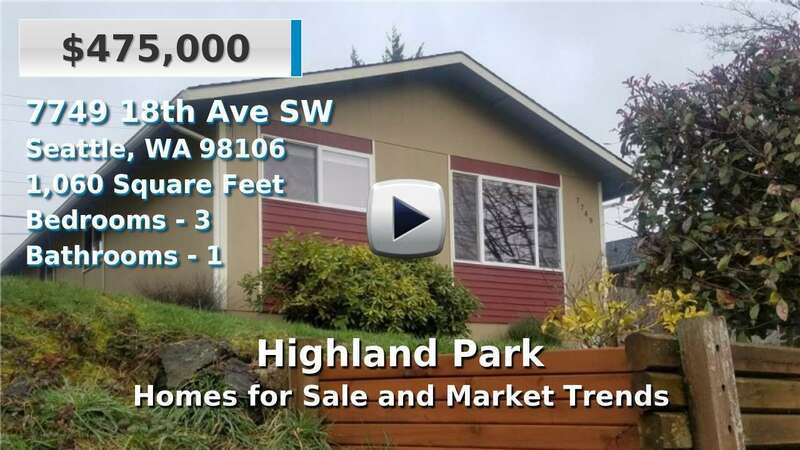 Currently there are 17 homes for sale, and 2 vacant land properties in Highland Park. Of the 19 total Highland Park residential listings for sale 0 are bank owned, 0 are short sales, 0 are new construction, and 0 are townhomes. The price ranges from $369,950 to $0 with a median list price of $615,788 and median sold price of $548,195. Make sure to refine your Highland Park real estate search by property type, price, square footage, bedrooms, bathrooms and more with the search tool above or view the Highland Park listings on our interactive map. Our Highland Park real estate listings were updated 14 minutes ago.